March 26 marks the birthday of the man behind one of my favorite books in our collection. Conrad Gesner was born in Zurich in 1516. His family was not wealthy, but thanks to various benefactors he was able to study and travel to Straussburg, Paris, Basel, and elsewhere. He became knowledgeable in many topics, including linguistics, botany, and zoology. He also received a medical degree and was a practicing physician. Five volumes were published in total, the first in 1551 and the last, posthumously, in 1587. The first volume was on quadrupeds that gave birth to live young, the second on quadrupeds that laid eggs, the third on birds, the fourth on fish and aquatic animals, and the last on serpents. 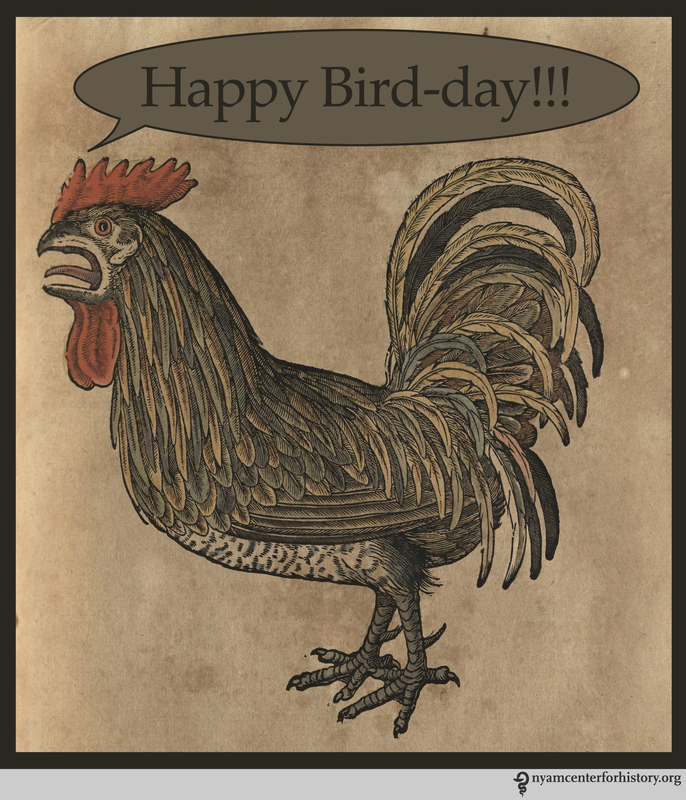 Since it is Gesner’s bird-day (get it? ), we’re celebrating with some of his flying friends from Liber III of the Historia Animalium. In our copy, a 1585 edition, the woodcuts are hand-colored and many of the birds’ French names were added in by an early reader. Peacock from Gesner’s Historia Animalium, Liber III. Toucans from Gesner’s Historia Animalium, Liber III. Help us identify this odd bird with floppy head feathers from Gesner’s Historia Animalium, Liber III. Vulture from Gesner’s Historia Animalium, Liber III. Bat from Gesner’s Historia Animalium, Liber III. Ostrich from Gesner’s Historia Animalium, Liber III. Stork from Gesner’s Historia Animalium, Liber III. Pigeons from Gesner’s Historia Animalium, Liber III. Barn owl from Gesner’s Historia Animalium, Liber III. Bird of paradise from Gesner’s Historia Animalium, Liber III. Flamingo from Gesner’s Historia Animalium, Liber III. Purple swamphen? from Gesner’s Historia Animalium, Liber III. Eagle from Gesner’s Historia Animalium, Liber III. 1. Locy, William A. The growth of biology. New York: Henry Holt and Company, 1925. 2. Locy, William A. Biology and its makers. New York: Henry Holt and Company, 1915. This entry was posted in Collections and tagged birds, Conrad Gesner, Historia Animalium, Item of the Month, natural history, ornithology by nyamhistorymed. Bookmark the permalink.